The BFI has officially announced that it is supporting the #IAmNotYourVillain campaign for its future productions and it will no longer fund movies featuring villain characters with facial scars. The British Film Institute (BFI) says it’s decision supports the growing #IAmNotYourVillain campaign which was started by Changing Faces, the United Kingdom’s leading charity group for people with a visible difference such as a mark or scar. 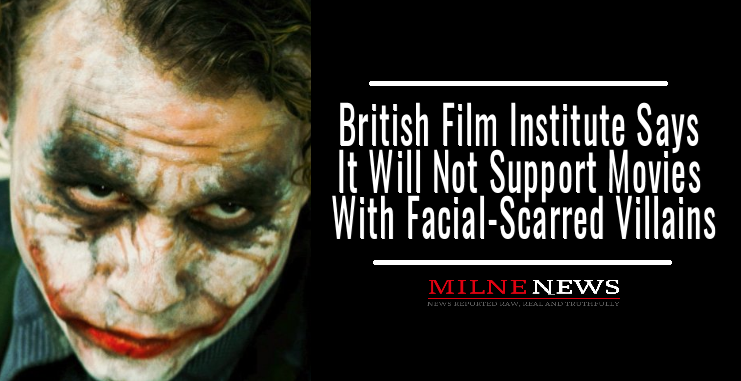 The group has made it their mission to de-stigmatize facial scars in film and television since scarring is often used on villains like The Joker, Darth Vader, and more, and now the BFI is vowing to support that effort. “Film is a catalyst for change and that is why we are committing to not having negative representations depicted through scars or facial difference in the films we fund,” BFI Deputy CEO Ben Roberts said in a statement. The BFI will not only stop funding films with facially scarred villains, but it will also attempt to course-correct the conversation around visible differences by financing the film “Dirty God.” The drama, set to premiere at Sundance in January 2019. The movie stars Vicky Knight as a burn survivor reentering society after an acid attack. Changing Faces provides advice, support, and psychosocial services to children, young people and adults with visible differences. According to the charity, there are 1.3 million people in the United Kingdom who have a visible difference. “We challenge discrimination and we campaign for Face Equality: a world that truly values and respects people who look different,” the charity’s website reads.